The former Maine Yankee facility on Bailey Point in Wiscasset, two decades after it shut down. Don Hudson of Arrowsic, chairman of the Maine Yankee Community Advisory Board, said Wednesday that it's likely the 540 metric tons of nuclear waste stored at the former Wiscasset plant will remain there for another decade, and maybe two. 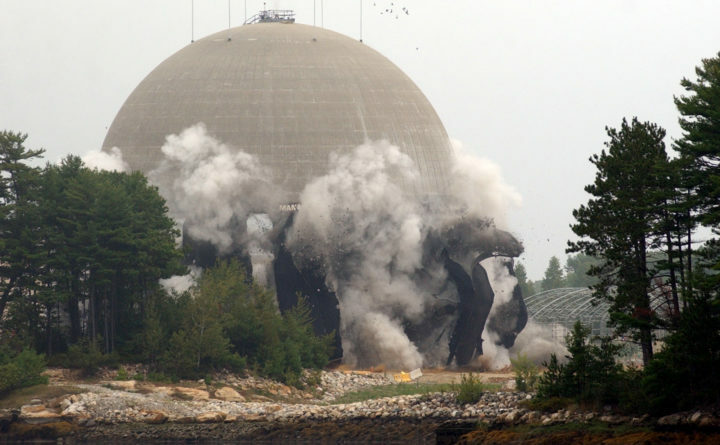 Explosives charges planted in the walls of the reactor dome of the former Maine Yankee nuclear power plant brought the 20-million-pound concrete and steel structure crashing down in 2004. WISCASSET, Maine — Atomic power has not been generated in Maine since 1996, but an end to the public health risk posed by nuclear waste stored here remains at least a decade away. And the impacts of climate change add a new sense of urgency to the hunt for a solution. The nuclear waste — 60 concrete-encased, steel canisters holding 1,400 spent nuclear fuel rods and four containers of irradiated steel removed from the Maine Yankee plant’s reactor vessel during decommissioning — will pose a threat to humans and the environment for at least 10,000 years. 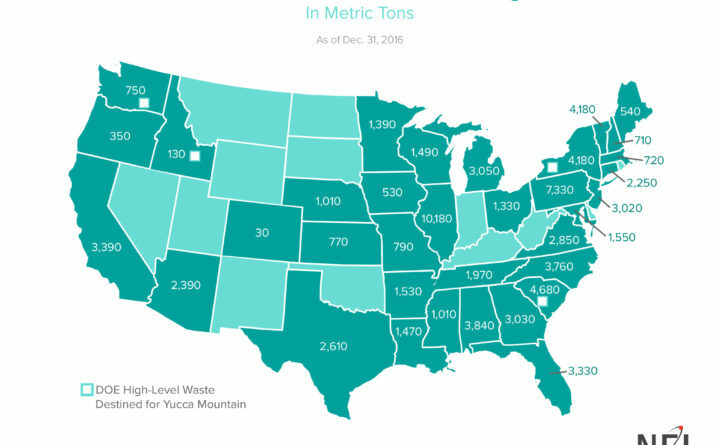 That’s why federal regulators and politicians for decades have sought a place to safely store the radioactive materials left behind by nuclear reactors. 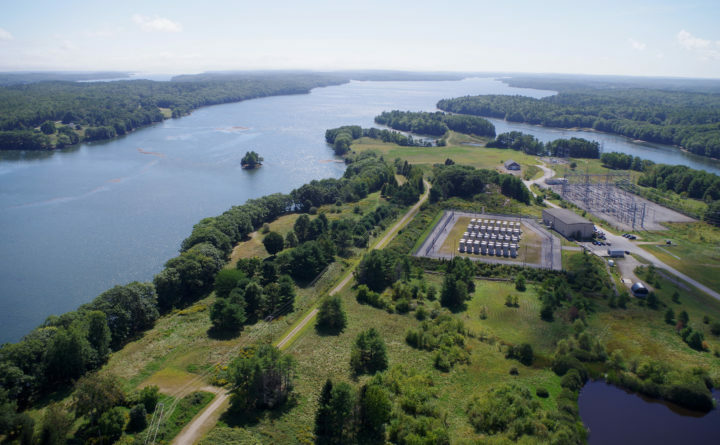 But 35 years after a law required the federal government to remove 540 metric tons of spent nuclear fuel from a Wiscasset storage site, the chairman of a local advisory panel said Wednesday the fuel likely will remain in Wiscasset for at least another decade — maybe two. Hudson, former director of the Chewonki Foundation, lives in Arrowsic, about 7 miles downstream from the former power plant on the Back River. In the 33 years since he built his house, he’s watched high tide levels rise year by year, raising concerns about potential storm damage to the 64 casks of waste encased in concrete about 30 feet above sea level just upstream. Eric Howes, spokesman for Maine Yankee as well as two other decommissioned plants, Yankee Atomic Electric Co. in Rowe, Massachusetts, and Connecticut Yankee Atomic Power Co. in East Hampton, Connecticut, said this week that President Donald Trump’s administration appears to have renewed efforts to build a geologic repository at Yucca Mountain in Nevada, and has included in its 2018 budget request funding to develop a solution to storing the waste. Maine Yankee generated power at the Wiscasset plant from 1972 to 1996, and was decommissioned in 2005 after an eight-year process. In 1982, the Nuclear Waste Policy Act required the U.S. Department of Energy to develop a geological repository for the country’s waste. In 1987, the act was amended to focus only on Yucca Mountain. When the federal government failed to begin removing the spent fuel from Maine Yankee as required in 1998, Maine Yankee, along with Yankee Atomic and Connecticut Yankee, sued the federal government. To date, Maine Yankee has been awarded $142.1 million by federal judges for the years 1998 to 2012, and in May filed a fourth lawsuit for $35 million for the years 2013 to 2016, Howes said, adding that the suits will likely continue until the spent fuel is moved. Nevada officials have opposed the Yucca Mountain site and filed hundreds of “contentions” the NRC would have to wade through in order to license the project. Instead, two towns were identified, one in Andrews County, Texas, and the other in Lea County, New Mexico, that offered to be voluntary interim storage sites, Howes said. But the Trump administration, including Secretary of Energy Rick Perry, have been outspoken in support of both Yucca Mountain and consolidated interim storage. The Trump administration requested funds in the fiscal year 2018 budget to move the Yucca Mountain license application forward, as well as create a “robust” interim storage plan, according to Howes. Various bills in the House and Senate have attempted to move the process along — most recently, Rep. John Shimkus, R-Illinois, sponsored HR 3053, a plan to restart the Yucca Mountain review and create consolidated interim storage sites — but Howes said the two bodies have not agreed on any direction. Spokesmen for U.S. Rep. Chellie Pingree, D-Maine, U.S. Sen. Susan Collins, R-Maine, and U.S. Sen. Angus King, I-Maine, confirmed their support Thursday. U.S. Rep. Bruce Poliquin, a Republican from Maine’s 2nd District, did not immediately respond to requests for comment. The bill is expected to pass, E&E Daily reported, but previous bills have required consent from the host states, and Nevada has expressed “stringent opposition,” Howes said. “The long and the short of it is, Congress needs to make a decision about policy for the government to meet its obligations and to dispose of the spent fuel,” he said. Meanwhile, since 1998, consumers of electricity generated by nuclear plants have paid into a nuclear waste disposal fund — which contains about $40 billion — though a court ruling in 2013 ended the requirement that the nuclear power plants themselves pay into the fund. But none of that waste has yet been moved. “We’re all paying about $10 million annually to watch that fuel age,” Hudson said.